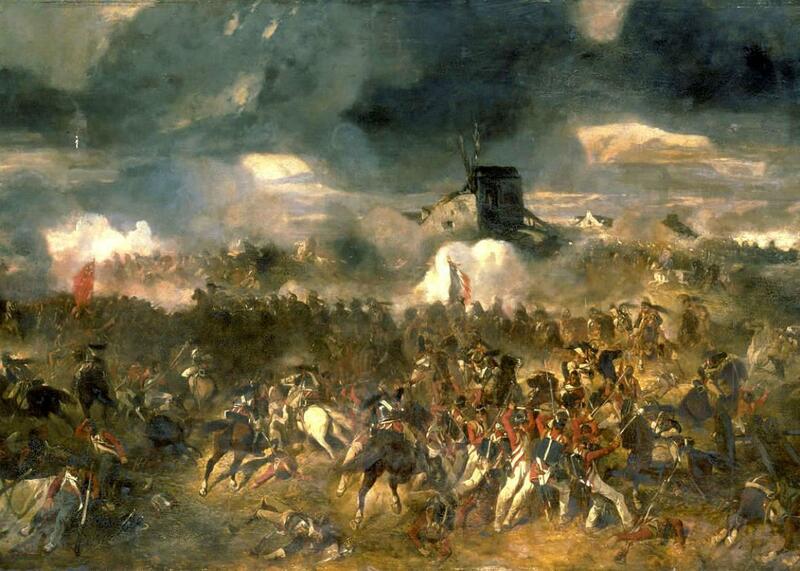 Why do history textbooks ignore the Battle of Waterloo? Clément-Auguste Andrieux, La bataille de Waterloo, 18 juin 1815, 1852. Google Books shows about 2 million hits for “Napoleon,” 1 million for “Admiral Nelson,” and half a million for “Arthur Wellesley.” So I don’t think it’s at all true that hardly anyone talks about them. However, consider that Napoleon was not only a military commander (and arguably, the best military commander in recorded history—certainly in the top 10). He was also the ruler of France during a key period in its history; his innovations included the code of laws that France (and several other European countries) still follows today. It was mostly thanks to him that the metric system came to be adopted worldwide. Thanks to him, we know how to translate Egyptian hieroglyphics. He and his armies swept away and discredited for ever the ideas of feudalism and theocracy in Europe. Napoleon had an influence on politics, law, culture, ideology, and science that stretched far beyond his role on the battlefield. Compared with him, Nelson was merely an admiral. Yes, a very notable one, one of the greatest in history, but just an admiral. He would have a chapter to himself in a book on warfare, but not in a book on, say, the rise of nationalism in Europe. Napoleon would appear in both. The same goes for Wellington (who, granted, was later a politician as well, but is not generally considered one of the key figures of 19th-century politics when compared to, say, Palmerston, Gladstone, or Disraeli). I’ve seen it said somewhere that Waterloo is the one day—June 18, 1815—that has had more written about it than any other single day in history. I’m not sure how true it is, and presumably more recent events will eventually eclipse it, but it’s definitely not ignored. However, while Waterloo was certainly important from a historical point of view as being Napoleon’s final defeat, it’s perhaps not as interesting when considered simply as a battle. It was a series of bloody frontal assaults, as Napoleon hurled his army against the Anglo-Dutch forces time and again, and they stood their ground and drove them off time and again—until as the sun was setting the Prussian army arrived on the flank, and Napoleon seeing the day was almost lost made one last-chance attempt to break through and then retreated. There were none of the dramatic maneuvers or daring breakthroughs or courageous battles against overwhelming odds that made, say, Austerlitz or Jena-Auerstedt famous.